Operators show how queries and statements are executed. They can be physical and logical. Logical operators present an operation on a conceptual level, while physical operators implement the operation defined by the logical operator using a specific method. In other words, a physical operator is an object or routine that executes an operation. Physical operators access columns and rows in tables and views, calculate expressions, create joins, etc. 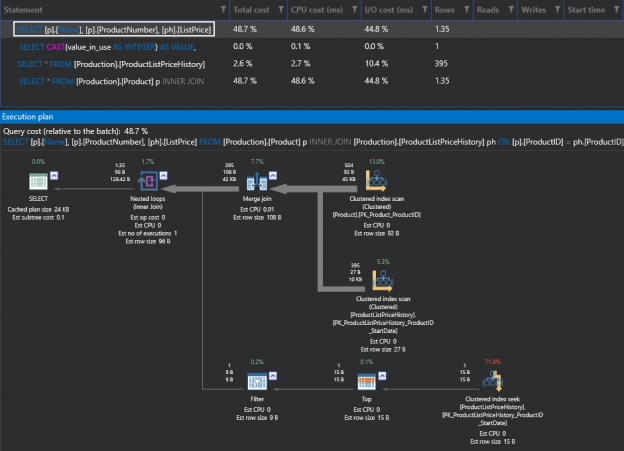 Besides the information presented by the icons and nodes, SQL Server query execution plans provide much more details in the icon tooltips. To see the tooltip place the mouse over the icon in the execution plan and include or exclude the desired property by clicking the star.